The Polite Mechanicals are Janet Ayers: violin & vocals, Hannah Dawson: vocals, accordian & ukulele, Allan Jones: banjo & ukulele, Dave Jordan: bass & vocals, Matthew Parsons: guitar & percussion. 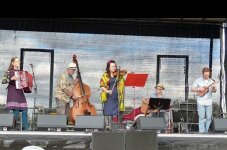 They combine post-contemporary folk/klezmer/jazz songs and tunes from England and elsewhere with a quirky dark edge. See their latest news and forthcoming events on Facebook.